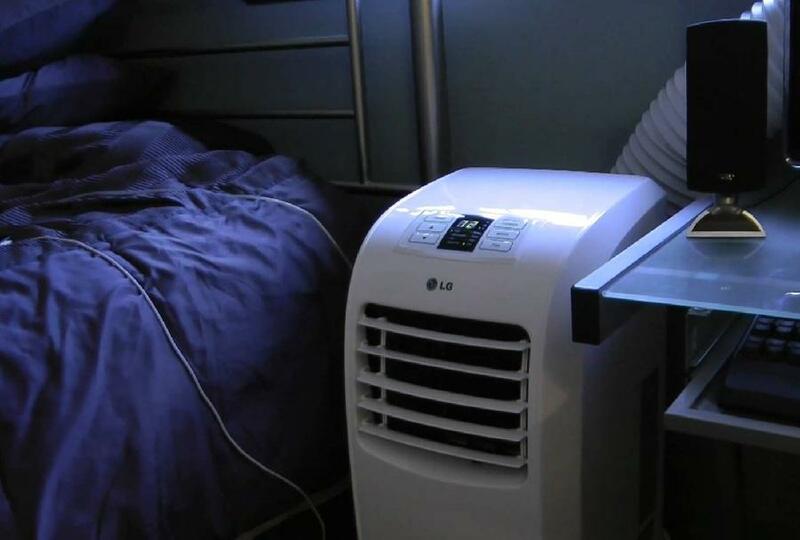 Portable air conditioners are awesome when used correctly, but people often find ways to misuse them, leading to higher-than-necessary utility bills, equipment failure and even an uncomfortable cooling experience. Here are some of the more common mistakes you should avoid when using one, and how to avoid making them. Using the correctly sized portable air conditioning unit is the most important aspect when it comes to effectively cooling your space. 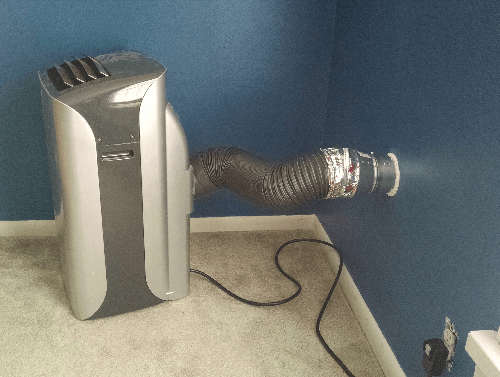 Many people tend to assume that buying the biggest air conditioner they can find will instantly mean a better and faster way to cool the space, but this is entirely wrong. Portable air conditioners are classified by BTU, making it easier to determine the correct size for your space. BTU is a way to measure how big of a space a unit can cool. We go into more detail about that here. Determining the correct size of nit for your room or space is a fairly simple process that begins by first measuring the square footage of the area you will be using it in. To measure the square footage of your space, simply multiply the length of the room by the width. Portable air conditioners pull the air in from the room, remove the moisture while cooling the air, and send most of the air back into the room. If you have a unit that has too many BTU for the space, your unit will constantly cycle on and off, creating an inefficient cooling process that is not only mediocre, but results in a clammy, humid room as well. A unit that is too small will stay on incessantly while still not getting the room to a cooler temperature. Both result in higher bills. Portable air conditioning units need to be vented. When they are in use, the air that doesn’t get blown back out as cold air needs to be sent out of the room, creating the need for ventilation. Without ventilation, you’d have a unit that is blowing out both cool and hot air, defeating the entire purpose. For whatever reason, some people decide that they don’t need to direct the ventilation outside of the room, sometimes opting for venting it away from the unit, or to a more open area. This results in a diminished cooling experience. Most portable A/C’s come with a window venting kit that makes it easy to set up. This usually involves cracking open a window enough to fit a bracket into, which helps to keep the window area sealed. The vent hose is then connected to the bracket, fully directing the hot air outside. Regardless of where you are using the unit, you must always make sure that it is fully vented and sealed off. If you are using the unit in a larger area with a sliding door, extend your bracket to fit the doorway, or purchase a bigger one. If you are using the unit in a garage or shed, use a jigsaw to cut a hole in the wall and direct the hot air to the inside of the wall or all the way outside. Portable air conditioners are less energy efficient than central air units in general, but they can still save you on cooling costs when used strategically. While there are many people who are mindful about their appliance’s energy use, plenty of others are apathetic. Energy efficiency in a portable air conditioner is a highly important trait, especially if you plan on using the unit frequently. 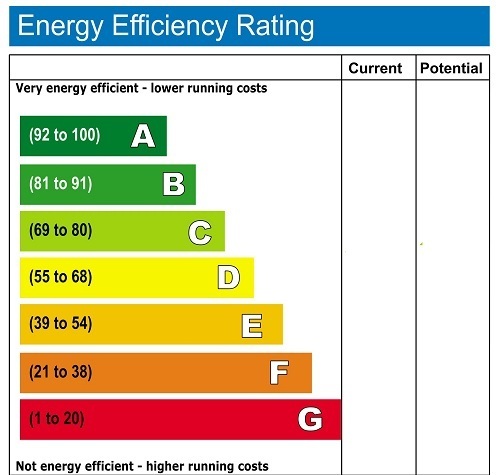 Choosing a model that is more energy efficient will save you money on your energy bills, which can certainly add up during the warmer months. Portable air conditioners come with an energy efficiency rating (EER) that makes it easier to compare models to one another. The rating is achieved by dividing the unit’s BTU amount by the amount of wattage it consumes. For example, a 14,000 BTU unit that consumes 1,500 watts would receive an EER rating of 9.3, which is very energy efficient. If you purchase a unit without first checking the EER, you may be in for a bit of a surprise when you get your first energy bill back from that month. 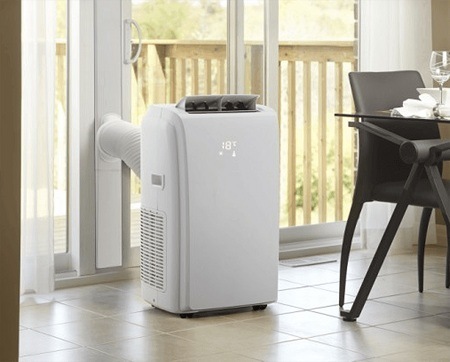 Portable air conditioners create condensate from the cooling process. This is due to the fact that they are constantly removing moisture from the air when in use. Some units are able to evaporate the moisture on their own, or at least most of it. Others have a drain hose that you can extend towards a drain, or up and out of a window if you have something like a condensate pump that can push the water through the drain hose. Many portable air conditioners use a bucket system, or have a sort of shallow pan underneath the unit that collects all of the condensate as it accumulates, preventing it from spilling out all over your floor. 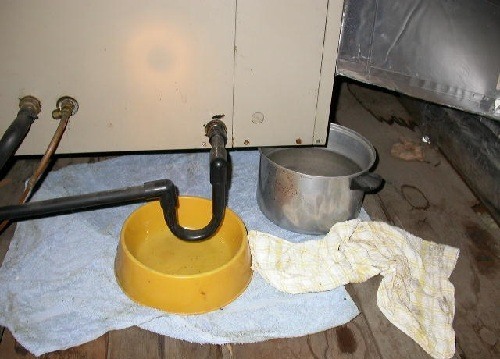 While this system is helpful in preventing spills, many people tend to forget the condensate is being accumulated at all, especially if they don’t use the unit on a daily basis for many hours. This leads to just leaving the water to sit in the bucket or pan for extended periods of time. This can lead to one of two things. First of all, you can leave the water inside the unit long enough for it to actually overflow, which can be a problem if you don’t happen to be in the room when it happens. The other outcome is that the water sits there for weeks on end, eventually creating mold. This mold will then be present in the air in the room, as well as possibly getting inside the unit, which will lead to many more problems, especially with allergies. If you have a hose system, be sure the hose is always draining properly to the drain in the floor. If you have a unit that accumulates the condensate, check frequently and dump the pan or bucket out when there is water present.